Las Vegas-based The Influential Network is one of the largest influencer marketing companies in the world. The Influential Network creates branded campaigns using top social media influencers on Twitter, Instagram, Vine, and Snapchat. The Influential Network is comprised of the top 400+ social media influencers representing over 500 million followers on top social channel sites. Steele says he and his team started as influencers first. The Influential Network raised a million dollars in the spring of 2014, built a small team, and set up shop in The Innevation Center. Since then, they have moved downtown, hired a sales team, built a dev team and raised a seed round of $1.5m lead by Europlay Capital Advisors. The team launched version 2 of their dashboard on May 1, 2015, plan to launch version 2 of their app on May 15, 2015 and then will launch their brands dashboard in June. 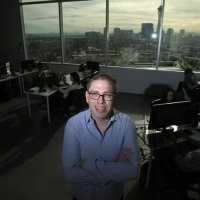 Coinciding with Collision, The Influential Network will host an Open House for the community to come meet the team and check out their Las Vegas office. Get all details for the event here. The Influential Network is hiring copywriters, national account managers and experienced sales people. They are also seeking local businesses to partner with to bring influencers when they are visiting Las Vegas. “For example, we bring people to the Voo Doo Zipline every time they come to town,” said Steele.